As hinted previously, the trip to Kumamoto and the examination of the historical record of Shinpuren gave Mishima a model and meaning for his future suicide. In fact, three years before his suicide he published a piece in the Yomiuri Shinbun, in which he stated rather wistfully the following words: “I think forty-two is an age that is barely in time for being a hero. I went to Kumamoto recently to investigate the Shinpuren and was moved by many facts pertaining to it. Among those I discovered, one that struck me particularly was that one of the leaders of theirs named Harukata Kaya died a heroic death at the same age as I am now. 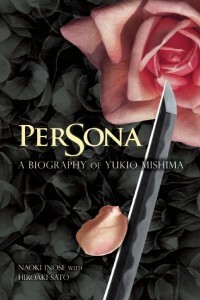 It seems I am now at the ceiling age of being a hero.” From such clues, which are actually numerous, the author argues that Mishima started at about forty to reflect on his own death and probably settled on terminating his own life upon the completion of his four-volume lifework The Sea of Fertility. Published: September 15, 2014 | This entry was posted in North American New Right and tagged book reviews, Japan, Naoki Inose, North American New Right, originals, Persona, Riki Rei, suicide, Yukio Mishima. Both comments and trackbacks are currently closed.